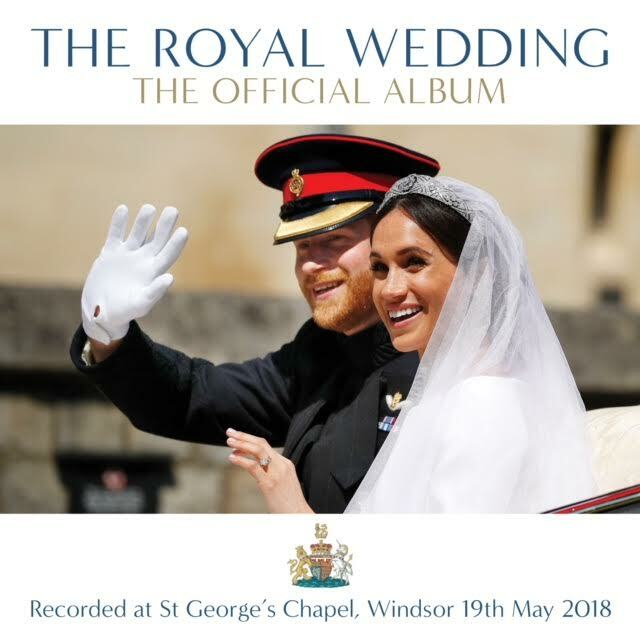 Decca Records is proud to release "The Official Recording of The Royal Wedding," one of the most eagerly awaited events of the year. Having recorded the entire service live at St George's Chapel, Windsor Castle today, every piece of music, the readings, blessings and the vows will be available to listen to permanently on all streaming services in just a few hours: a first for a Royal Wedding. The physical album, on CD, will then be released into retail stores around the world from May 25. The recording will also be made available on vinyl. The musical highlight of the moving and joyous ceremony was British cellist, Sheku Kanneh-Mason, one of the most exciting musicians of his generation, who was personally asked by the bride and groom to perform at their wedding. The 19-year-old musician took centre stage for the all-important signing of the register. Dressed in a black Paul Smith suit with vibrant pink tie, Sheku played three beautiful pieces: Sicilienne by von Paradis, Schubert's Ave Maria, and Après Un Rêve by Fauré. Kanneh-Mason was accompanied by orchestra*, as the Royal Couple officially became husband and wife. "It was such an awesome moment - just really incredible to perform for Prince Harry and Meghan at their wedding. The atmosphere was amazing and I'm proud to have played a small part in the celebrations. It's a day I will remember for the rest of my life," Kanneh-Mason said. Enhancing the emotion of the occasion, the personal musical choices of Prince Harry and his new wife - The Duke and Duchess of Sussex - include Handel's "Eternal Source of Light Divine," John Rutter's "The Lord Bless You and Keep You" and the hymn "Lord Of All Hopefulness," as well as two popular tracks performed by The Kingdom Choir conducted by Karen Gibson: Ben E. King's hit song "Stand By Me" and the gospel tune "This Little Light Of Mine." The orchestra was fronted by Welsh soprano Elin Manahan Thomas and accompanied by trumpet player David Blackadder, organist Luke Bond and State Trumpeters from the Band of the Household Cavalry. The album's producer is one of the world's most experienced, Anna Barry. Grammy-nominated Barry has produced over 500 recordings over 25 years, ranging from works by Andrew Lloyd Webber to opera at the Mariinsky Theatre with Valery Gergiev, and many other legendary artists including José Carreras and Zubin Mehta. In a feat of both musical engineering and co-ordination, Barry and the team are delivering a state of the art recording in record-breaking time. The complicated logistical process includes the digital transfer from St George's Chapel to the mastering in a Kensington studio in order to reach digital platforms faster even than for the wedding of the Duke and Duchess of Cambridge. "It is a massive responsibility with absolutely no room for error, so I will be relieved when it's over, but very happy and honoured to be a part of this day," Barry said. Decca Records is part of Universal Music, the world's leading music company, and has previously recorded and released the Wedding of The Duke and Duchess of Cambridge in 2011, as well as the Wedding of The Prince and Princess of Wales in 1981, and the Funeral of Diana, Princess of Wales in 1997. This uniquely original new recording, released today, will be the next in a historic line to mark major milestones for The Royal Family, and as such it will enter the homes of millions across the whole world. Rebecca Allen, President of Decca Records, said, "Decca are hugely honoured to have been involved in recording this remarkable day. The choices of music, and the artists involved, were of the highest quality and will now be available for everyone around the world to listen back to, again and again." Dickon Stainer, President & CEO, Global Classics & Jazz, said, "Every word and every note of music from this historic event are now captured forever in the highest quality sound recording. It is something magical and unforgettable." The Royal Foundation is used as the main vehicle for Their Royal Highnesses' philanthropic activities, including programmes such as Heads Together, Coach Core, and the Endeavour Fund (reg. charity no. 1132048). Markle will join The Royal Foundation as its fourth Patron following her marriage.